Cyprus NGO Initiative, together with the INGO Conference of the Council of Europe and the Commissioner of Voluntarism and NGOs, are co-drafting a Policy Paper on the Empowerment of the Civil Society in Cyprus. 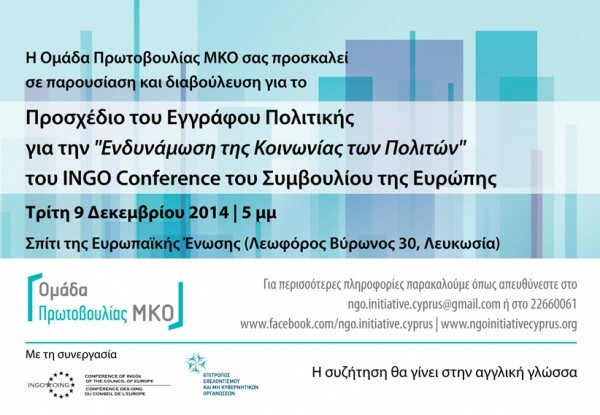 INGO Conference will present the first draft of the above mentioned Policy Paper and a discussion will follow. The Policy Paper will be published at the website of Cyprus NGO Initiative after the presentation on December 9th, and will be open for comments from the Civil Society of Cyprus for one month. For more information, please contact us at ngo.initiative.cyprus@gmail.com or 22660061.